"This recipe is bright, creamy, salty, and slightly burned and crunchy. It's a delightful sensory experience, and also kind-of healthy, if you believe in that sort of thing! Also, this recipe would make a great paleo dinner with some spiraled veggie pasta." Combine broccoli, red bell peppers, and yellow onion in a large bowl. Add olive oil, juice of 2 limes, and 1/2 teaspoon salt; toss to coat. Spread vegetables onto a baking sheet. Roast vegetables, stirring 1 or 2 times, in the preheated oven until edges begin to blacken, about 30 minutes. Remove from oven and cool slightly. Fill a large pot with water and 1/2 teaspoon salt; bring to a boil. Stir in penne and return to a boil. Cook pasta uncovered, stirring occasionally, until cooked through but still firm to the bite, about 11 minutes; drain. Blend avocados, juice of 2 limes, garlic, and 1/2 teaspoon salt in a food processor or blender until sauce is smooth, scraping down sides as needed. Add 1/2 cup chopped cilantro and pulse until just incorporated. Gently toss pasta, roasted vegetables, and sauce together in a large bowl. Garnish with cherry tomatoes, cilantro stems, sea salt, and black pepper. If using a blender for the sauce, you may want to dice the avocados before blending so that the mixture processes more evenly. Lemon juice can be substituted for the lime juice, if desired. It's not as good, but it's still totally awesome. Zucchini and mushrooms are both great in this dish, too, just not as pretty as broccoli and red bell peppers. I like all these parts, roasted veggies, guacamole, and pasta..but together it didn't work for me. 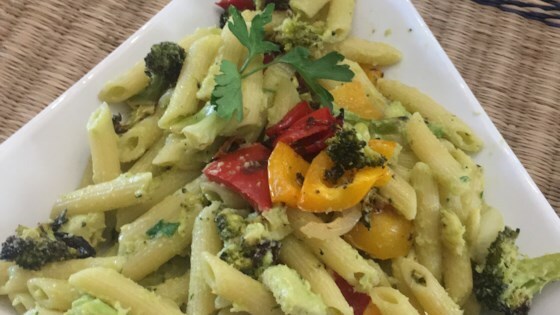 the guac is too mild to stand out with the pasta and doesn't mesh with the roasted veggies. Sooo good! My family loved this too. Next time I think I will use maybe one more avocado. I also used a sweet onion inwith tthe veggies! Delish! Will absolutely make again. Really liked the sauce! I will make again, but tweak to our tastes. Substituted in green peppers due to availability. Try it with a dash of soy sauce - it ended up complimenting the dish super well! I liked it. I would definitely go with less lime and less salt next time, but otherwise this will be one I try again.